MainAll NewsInside IsraelWhat has become of Haaretz? What has become of Haaretz? 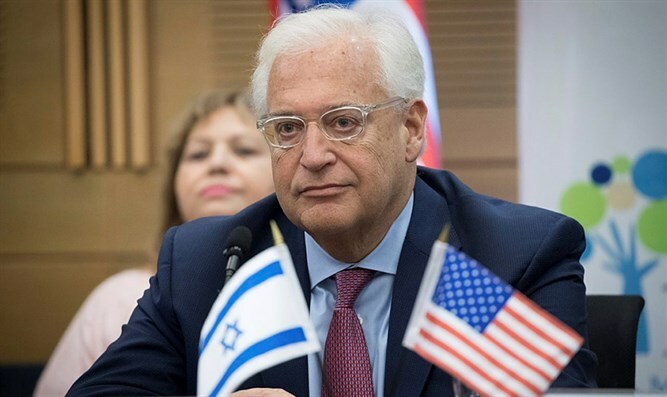 US Ambassador to Israel David Friedman on Friday slammed the Haaretz newspaper and its journalist Gideon Levy for an article calling Har Bracha, the hometown of a terror victim, "a mountain of curses." Itamar Ben Gal, a 29-year-old father of four, was killed on Monday by an Israeli Arab terrorist at the entrance to Ariel. The Ben Gal family lives in the town of Har Bracha, which literally means "a mountain of blessings." In his article, Gideon Levy also slammed the fact that Friedman has previously donated an ambulance to Har Bracha. "With the 'Friedman ambulance' and without it, Har Bracha is a mountain of curses," Levy wrote. "It's a settlement that, like its sisters, was founded in order to poke sticks in the eyes of the Palestinians and rods into any chance for a peace agreement. Settlements [are] provocations." "In the case of Har Bracha, the stick is tangible: It overlooks Shechem (Nablus) and threatens its development. Because of [Har Bracha], Shechem sometimes becomes a prison, like it was during the Second Intifada. All because of Har Bracha and similar [towns]..."
On Twitter, Friedman asked, "What has become of Haaretz? Four young children are sitting shiva for their murdered father and this publication calls their community a 'mountain of curses.' Have they no decency?"